Benefit 1: Reduction of blood pressure – A study observing people with an average systolic blood pressure of 146 lowered their borderline high to normal blood pressure range after practicing meditation for several weeks. Benefit 2: Improved sleep – Those who meditate regularly tend to fall asleep quicker and sleep deeper, which mean they get a better quality of sleep and wake up feeling more energetic and calmer throughout the day. Benefit 3: Increased circulation to organs and glands – Relaxed blood vessels allow increased blood flow to the brain, which means we think more clearly. This helps to prevent strokes. Better flow of blood helps the digestive system to function better. Benefit 4: Balancing of the two hemispheres of the brain – Studies show that meditation has a balancing and harmonizing effect on the right (emotions) and left (thinking) hemispheres of the brain. Benefit 5: Controlling Asthma - A clinical research reported that 94% of a group of asthmatic patients showed less air passage resistance after practicing meditation. Benefit 6: Reduction of mental tension – Up to 74% of all health problems are considered psychosomatic. Meditation reduces stress which helps with the cure of many of these disorders. Benefit 7: Keeping you young – Meditation stimulates your hormones. Hormone levels in those who meditate are similar to people that are 10 years their junior. Meditation also causes a reduction in the production of stress hormones. Benefit 8: Reversal of ageing – According to a USA study, those practicing meditation for more than five years were physiologically 12 years younger than their chronological age. Short-term mediators were five years younger than their chronological age. Benefit 9: Increased Alertness – A French study reported in their EEG studies that during meditation there is a unique combination of deep relaxation and increased alertness. Benefit 10: Optimizes brain function - Reports published in the International Journal of Neuroscience claim that higher levels of EEG coherence, measured during the practice of meditation, are significantly correlated with an increased fluency of verbal IQ. Benefit 11: Decreases dependency on drugs – A study on the effect of meditation on drug use was done by Dr. R.K. Wallace and Dr. H. Benton and associates. There were about 1,800 participants that were using marijuana, hashish or both. After 21 months of meditation, only 12% continued the use of drugs. When questioned why the mediators gave up drugs, the general response was that they enjoyed the profound feelings from meditation more than the feelings aroused by the drugs. By applying acupressure to Conception Vessel 6 (CV6), this can help regulate the Chi functions and Chi circulation in your body. This is one of the most empowering acupressure points on the body. Location: Two finger widths below the navel (see above illustration). Technique: Using the middle finger, apply pressure perpendicularly and use gentle rotating movements with the fingertip. Benefits: 1. Develops vitality, strengthens immune system, urinary system, benefits kidneys, and sexual reproductive system; 2. Good for relieving stomachache, abdominal cramping, gas, irritable bowel syndrome, and menstrual cramp; 3. For constipation press CV6 two or three times a day to relieve or prevent constipation and irritable bowel (also include deep breathing); 4. Good for emotional stability, deepening spiritual awareness, sense of self, used for self-abuse, addictive behavior, and co-dependency issues. I generally do not include this many attributes for an acupressure point, but today it seemed appropriate to cover the majority. Jump start your energy system and get the energy flowing by tapping or massaging the kidney points (K-27) sometimes referred to as the energy buttons. This is how to boost your natural energies and reset your electro-magnetic body. 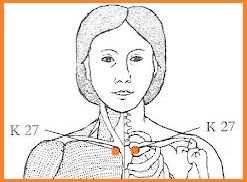 You can find the K-27 by placing fingers on both sides of collarbone. Then slide finger toward center and find bumps where they stop. Move fingers down about an inch where there is a slight indent on most people. These points might feel sore to touch. K-27 Exercise: First cross your hands using your right index and middle fingers to stimulate the left K-27, and your left index and middle fingers to stimulate the right K-27. Start tapping or massaging gently both K-27 points at the same time while breathing deeply in through your nose and out through your mouth. Continue for about twenty seconds. If these energy buttons are sore, it is an indication they need attention as this is where stress hormones accumulate. You can gently massage these points throughout the day to revive the body. Are you someone who spends long periods of time working at a desk, or someone not aware of the time spent working on projects, or someone who sometimes just likes taking well earned couch potato time. If you are not getting up and moving around, this could create a circulation problem in the legs. Please consider taking a few minutes every 20 minutes or so to massage Spleen 10 acupoint. The location is on the inside of the leg just above the knee. It is best to find Spleen 10 in a sitting position. Rest hands on both legs at top of knee then move up approximately two inches where you feel the muscle with the thumb on the inside of the leg (see picture). You can begin to massage with your thumbs Spleen 10 on both legs at the same time. 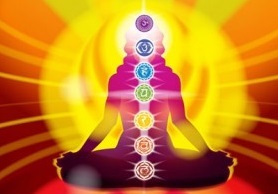 Swimming, jogging, and push-ups are great energetic exercises for the Heart Chakra. However, I have found a more challenging and fun exercise which possibly some of us haven’t tried since our childhood. It is playing with a hula hoop. If you haven’t noticed, this round object can still be found. 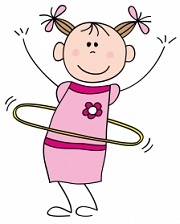 Truly this is a great Heart Chakra exercise, even if you are one of the many that can’t get the hoop to hula, your inner child will have such a blast trying. While practicing this Heart Chakra exercise it is a perfect time to hum, chant or sing the words: love, love, love. Opening up our hearts to our self and others is the best healing exercise to open up the Heart Chakra. The following advice is from the Mayo Clinic on reducing stress by eliminating negative self-talk. 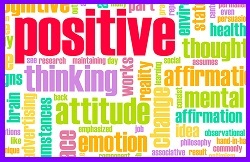 First, Identifying Negative Thinking: (1) Filtering – magnify the negative aspects of a situation and filter out all the positive ones; (2) Personalizing – automatically blame yourself when something bad occurs; (3) Catastrophizing – anticipate the worst if something goes wrong; (4) Polarizing – see things only as good or bad, black or white. There is no middle ground. Here are some ways to practice turning negative thinking in a more positive and optimistic way - Focusing on Positive Thinking: (1) Identify areas of your life that you think about negatively. Start small by focusing on one area to approach in a more positive way; (2) Check yourself throughout the day. When your thoughts are negative try to find a way to put a positive spin on them; (3) Be open to humor -When you can laugh at life, you feel less stressed; (4) Follow a healthy lifestyle – including exercise, healthy diet, and learning other healthy options to manage stress; (5) Surround yourself with positive people; and (6) Practice positive self-talk by practicing this one simple rule: Don’t say anything to yourself that you wouldn’t say to anyone else. I have included the Mayo Clinic link if you choose to read more on reducing stress by eliminating negative self-talk. Here are some of the benefits when applying pressure to acupoint Heart 7 also referred to as “Spirit Gate”. It calms the heart and mind, helps with insomnia. If you are one that wakes often during the night, try rubbing with light pressure Heart 7. This acupoint also is used for anxiety, fear and nausea. The location is on the outside edge of the wrist crease closest to the palm. It is in the hollow area in line with the little finger (see red dot on photo). It is best to turn the palm upwards and support the wrist in the fingers of the opposite hand. 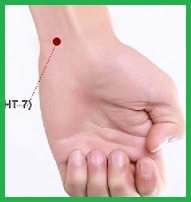 Locate Heart 7 with the thumb and apply pressure. Can also do circular motion with thumb. Remember to repeat acupressure on the other wrist. Acupressure used on the Large Intestine 4 helps benefit the following issues: HEADACHES, SINUS INFECTIONS, TOOTHACHES, REDNESS – SWELLING OF THE EYES, or SWELLING – PUFFINESS IN THE FACES. The Large Intestine 4 can be located on the mound of flesh in the web between the thumb and index finger. To start using acupressure on yourself, use the diagram shown above and apply moderate to deep pressure on the tender spot (Large Intestine 4) with the thumb from the opposite hand using tiny circles as you continue to apply pressure for 2 minutes. Remember to complete this acupressure exercise on your other hand. Contraindications: Strong pressure should be avoided on all points during pregnancy especially Large intestine 4. It is recommended to just lightly touch with thumb. These are the benefits of applying acupressure to the Governor Vessel 20: Increases mental alertness, concentration and balances the mind. 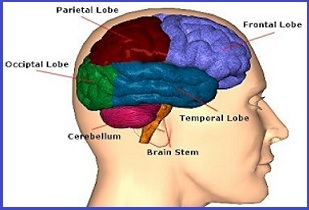 Oriental medicine views physical and meridian balance an important aspect of mental and emotional health. Acupressure points that strengthen the internal organs and promotes circulation through the vessels and meridians help maintain mental and emotional balance. To locate the Governor Vessel 20, place your thumbs on the top of each ear, stretch the middle fingers out to meet at the top of the head. This point location should be felt as a small depression in the scalp and may feel slightly tender. 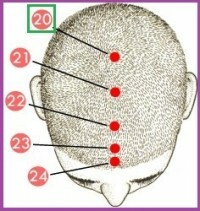 Apply gentle acupressure perpendicularly into the scalp using the middle or index finger. You can also use a circular motion to message the Governor Vessel 20. Do not overstimulate this point if suffering from high blood pressure.